Welcome to the StayWell Manor Village, offering you exceptional senior living - for life. The StayWell Manor Village is a premier seniors’ community able to meet your changing needs. Our unique community offers Independent Living, Independent Living with Assistance, Enhanced Care and Memory Care for those requiring guidance with a structured environment. The unique All-Inclusive Program provides a wide range of services and amenities where Residents remain as independent as possible. 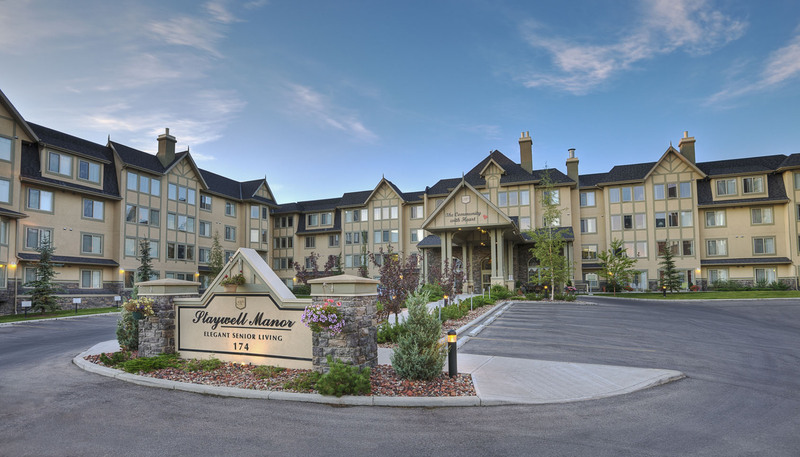 Conveniently located in the award winning Garrison Woods neighborhood in Southwest Calgary, The StayWell Manor Village is centrally located and is close to local amenities too. At The StayWell Manor Village, we can meet your changing needs and future requirements. Come and visit us today! The StayWell Manor Village is located in the quiet serenity of a well-established South West residential community. Built in a grand Colonial style to fit in with the historic style of housing in this sought-after area, The StayWell Manor Village feels more like a five star hotel than a senior living community! Calgary enjoys a premium position in Alberta Canada, close to the Rocky Mountains yet basking in more hours of sunshine during the winter than any other major Canadian city. With over 3000 eateries, lots of festivals including the Calgary Stampede, and a population that’s easy-going and relaxed, this is a city in which seniors can feel at home and build new memories with friends and family, or reflect on old ones in a safe and supportive city. The StayWell Manor Village offers an exceptional range of amenities and services for Residents, designed to ensure the very best Lifestyle ExperienceTM possible. Our range of lifestyle services have been created to add ‘life to years as well as years to life’. Also, all our lifestyle services are included in the Monthly Lifestyle fee, so residents and their families needn’t worry about unexpected costs or bills. Our residents enjoy a wide variety of outings and events, with guest entertainers coming to put on shows and get everybody involved as well. You can’t help but have a great social life at the StayWell Manor Village! All Manor Village senior living communities have an in-house health and wellness services, designed to help you keep at your own optimum health and fitness. Our specialist team is on hand 24/7 to help you lead your life the way you want to, with the level of support you need. Lifestyle Choices at The StayWell Manor Village , South Calgary. At The StayWell Manor Village, you choose the level of support you or your loved one requires to preserve independence and lead life to the full. Enjoy independent living supported by a comprehensive range of services and amenities to help you preserve your independence for longer. Make the most of life with assisted living at The Manor Village, with professional support services and a structured Health and Wellness program, so you can live independently with just the amount of support you need. Enhanced care is a lifestyle that provides additional care services tailored to your precise needs to maintain your quality of life. Our team works with you and your family to identify the specific care requirements you have, and put in place appropriate support, so you can enjoy all the amenities and social opportunities The StayWell Manor Village has to offer. Our Hearts Memory Care offers highly specialized, person-centered care to senior Residents living with a wide range of memory challenges in secured neighborhoods at The StayWell Manor Village. Each Our Hearts Memory Care neighborhood provides a broad range of engaging activities and ongoing guidance, in a secure and caring environment. Our Memory Care suites are ergonomically and specially designed to allow reduced anxiety for our Residents. At The Manor Village we have thought of everything in order to help you enjoy life in your new home at The StayWell Manor Village – The Community With Heart! The Our Hearts Memory Care respects and honors the unique qualities, interests, and needs of each person to ensure a personal Lifestyle ExperienceTM for every Resident. Lease fees include all the benefits of The Manor Lifestyle ExperienceTM as well as the Meal Program. Enjoy your lease plan! Lease fees include all the benefits of The Manor Lifestyle as well as the Meal Program. Lease fees include all the benefits of The Manor Lifestyle as well as the Meal Program, including 3 meals per day, nutritious snacks, lifestyle services – and much more! Additional personalized health care services for Enriched Living are charged individually and in addition to the standard monthly Lifestyle fee. Welcome to fine dining at the Medallion, Regency and Sunrise Dining Rooms for exquisite breakfast, lunch and evening meals. Enjoy chef-designed meals prepared fresh by our skilled kitchen staff every day. We can even cater for birthdays, anniversaries and other special occasions so you can share your special days with family and friends! Our innovative, balanced and tasty Meal Program ensures everyone can enjoy nutritious meals of quality and variety. We aim to provide your main meal of the day is lunch, allowing more time for digestion. Look forward to every meal in our elegant Regency Dining Room - why not invite your friends and family too! Our StayWell Manor Village Preservation of Independence Health & Wellness program is designed to help meet your changing health needs, optimize your wellbeing and enhance your general enjoyment of life. Life at The StayWell Manor Village offers complete freedom from the stresses of home ownership, including insurance, maintenance, repairs and decorating. So you have time to focus on enjoying life!